Growing Green in Indiana – Volunteers Needed! Do you love nature and particularly TREES? Many have come to a higher appreciation of the benefits that trees add to our quality of life. Do you live in an urban area, but due to construction projects to expand commercial and residential areas or natural disasters, there is a need for more “green” infrastructure? We are compiling a list of non-profit organizations that are passionate about trees and sustaining, restoring, creating our urban forest spaces. Consider taking part of their volunteer opportunities or donating towards a project that touches your love for trees as well. 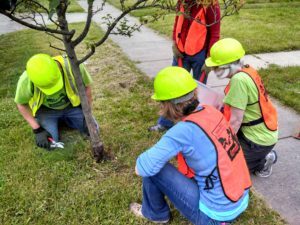 Indiana Community Tree Stewards: The Indiana Community Tree Steward Program is offered three times a year throughout the state. Participants learn about the basics of urban tree care and how to communicate the benefits of urban trees. Attendees are asked to then use their skills by volunteering 15 hours of service to local communities to improve or maintain the urban forest. For the latest tree steward opportunities and training sessions, go to the ICTS official Facebook page. Trees Indiana: Offers a variety of events and programs designed to engage urban youth in learning more about their environment and the important role trees play in our health as a society. Keep Indianapolis Beautiful: KIB can help whether you’re looking for information and resources to clean up your block, to beautify your neighborhood, or to plant trees! The Indiana Tree Project: The Indiana Tree Project is a joint effort between the Indiana Natural Resources Foundation; the Indiana Department of Natural Resources, Division of Forestry; and the citizens of Indiana. TITP is dedicated to planting and expanding Indiana’s forests. By donating to plant trees, you will help wildlife, prevent soil erosion, support our state’s largest agricultural industry, and bring back natural beauty to our state. Help a greener Indiana take root. Do you know of other organizations that support urban forestry needs? Are you an organization that advocates for urban forestry? Tell us HERE and let’s get you on our list so that we can be another avenue to link volunteers and donators to your site.